Your Clients Need an Incapacity Plan that Works When Needed | The Levin Law Firm - Philip Levin, Esq. Mental incapacity caused by an accident, injury, or illness means that you might be incapable of making informed decisions about your finances and well-being. Without a comprehensive incapacity plan in place, a judge can appoint someone to take control of your assets, and make all personal and medical decisions for you, through a court-supervised guardianship proceeding. You and your loved ones could lose valuable time, money and control until you either regain capacity or die. Planning Tip: You may believe you are protected if you become mentally incapacitated because you hold your assets in joint names with your spouse, a child, or another family member. While a joint account holder may be able to access your bank account to pay bills, or access your brokerage account to manage investments, a joint owner of real estate will not be able to mortgage or sell the property without the consent of all other owners. Aside from this, adding names to your accounts or real estate titles may be deemed a gift for gift tax purposes. In addition, if a joint owner is sued, your property could be seized as part of a judgment entered against them. Only a comprehensive incapacity plan will protect you and your assets from a court-supervised guardianship proceeding and the potential actions or misdeeds of your joint owners. Financial Power of Attorney – This legal document gives your agent the authority to pay bills, make financial decisions, manage investments, file tax returns, mortgage and sell real estate, and address other financial matters that are described in the document. Financial Powers of Attorney can be designed in two different ways: “Durable” and “Springing.” A Durable Power of Attorney becomes effective immediately after it is signed, while a Springing Power of Attorney only goes into effect after you have been determined to be mentally incapacitated. Revocable Living Trust – This legal document has three parties to it: The person who creates the trust (the “Grantor” or “Settlor”); the person who manages the assets transferred into the trust (the “Trustee”); and the person who benefits from the assets transferred into the trust (the “Beneficiary”). In the typical Revocable Living Trust situation you will be the Grantor, Trustee, and Beneficiary of your own trust. However, if you become incapacitated, then your Successor Trustee can step in and manage the trust assets for your benefit. Planning Tip: To be part of an effective incapacity plan, your Revocable Living Trust should contain provisions to determine your mental status through a private process (i.e., certification from a physician) instead of a public court process. In addition, the trust agreement should contain specific instructions about how to take care of you if you are declared mentally incapacitated. Medical Power of Attorney – This legal document, also called an Advance Medical Directive or Health Care Proxy, gives your agent the authority to make health care decisions for you if you cannot do so because you have become incapacitated. Living Will – This legal document gives your agent the authority to make life-sustaining or life-ending decisions for you if you become incapacitated. HIPAA Authorization – Federal and state laws dictate who can receive medical information without the written consent of the patient. This legal document gives your doctor, or other health care providers, the authority to disclose your medical information to the agent you select. Planning Tip: Your loved ones may be denied access to medical information during a crisis situation and end up in court fighting over what medical treatment you should, or should not, receive (like Terri Schiavo’s husband and parents did, for 15 years). Without these three documents in force, a judge may also appoint a Guardian to oversee your health care, thereby adding further expense, delay, and complexity to your court-supervised guardianship. Therefore, you should have these three documents reviewed and updated if necessary, to ensure they accurately reflect your current wishes. 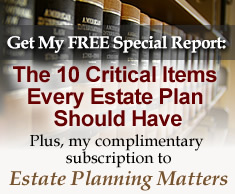 As time marches on, and your life changes, your incapacity plan may easily become outdated. Therefore, it is vital for you to have your incapacity plan reviewed every few years, or after a major life event (such as a divorce or a death) to ensure that your plan will work the way you desire it to work if it is ever needed.